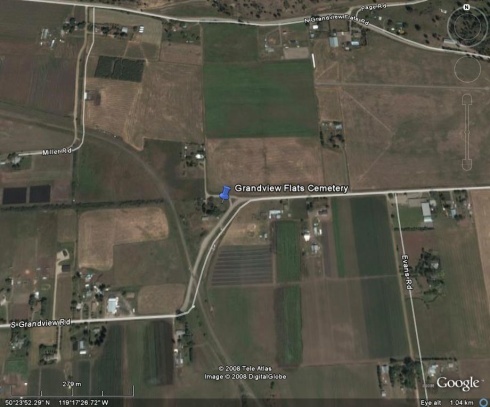 The following is a transcription of the Grandview Flats Cemetery located South Grandview Flats Road in Spallumcheen, British Columbia, Canada. Latitude: 50o 23' 52.30" N.
Longitude: 119o 29' 29.74" W.
The Grandview Flats Cemetery was established by the Seventh-Day Adventist Church around 1910. 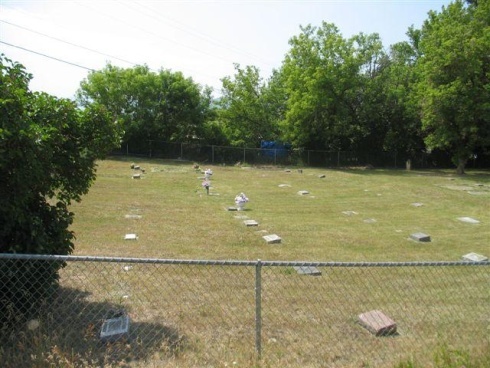 The cemetery is approximately an acre in size and well maintained. 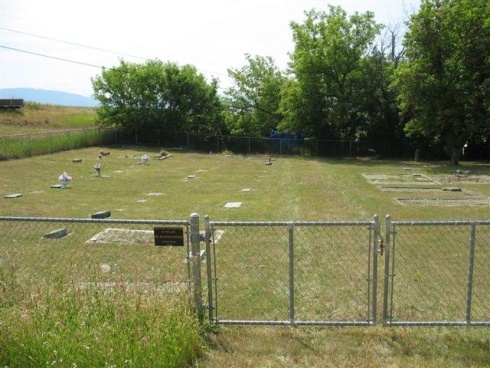 Dr. Richard Poirer donated a new chain link fence to surround the cemetery in 2000. The cemetery has over 100 graves laid out east/west. It is a small graveyard and fairly well kept, though many of the graves are not marked and a few of the stones are unreadable. The majority of the monuments are simple blocks made of marble and granite. In addition, many who are buried without a marker have a cement block with a plaque bearing the interments name. In Armstrong, from Highway 97A, turn west onto Smith Drive. Follow Smith Drive to the north (right) at the junction one block after the turn from the Highway. Proceed north on Smith Drive, turning left as it becomes Pleasant Valley Road (signs designate this). Go west to Okanagan Street, turn north (right) for one block to Wood Avenue, turn west (left) and proceed to Otter Lake Road (1.1 km). Turn south-west (left) on Otter Lake Road and travel for 5.7 km. - you will be at a "Y" in the road. Take the road to the right called Grandview Flats, travel for 3.1 km. This is a confusing intersection of roads and private driveways, but keep to your left on what is called South Grandview Flats Road for 0.6 km. The road goes to the left down a hill and there is what looks like a private driveway straight ahead - go straight ahead. The cemetery is on the left next to a house. To view a map of the roads mentioned above go to Google Maps and enter South Grandview Flats Road. Armstrong, B.C.